New readers might wonder why I have the little box warning off the self-published. This review and book are absolutely nothing to do with me, but the whole thing's a classic example of how not to respond to a review. Regular readers of this blog will know that I like Janet Rising's Pony Whisperer series. Janet, who besides being a writer is the current Editor of Pony Magazine, kindly agreed to do an interview for the site, and here it is. When did you first get the horsy bug? I have always had the horsy bug – it’s more a disease. I am the only one in my family to be so afflicted and I have no idea where it came from – it must have skipped a couple of generations. 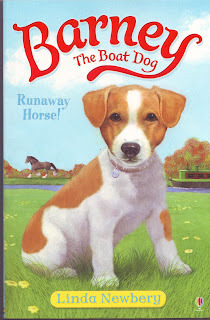 As a child I had hundreds of model ponies of various sizes (still stashed away in my loft), I drew, wrote about and dreamed ponies, galloped around the garden and rushed out to feed the rag-and-bone man’s horse whenever it clip-clopped along our road. I had no hope of getting a pony of my own but it didn’t stop me being involved with horses. I loved horses so much, it hurt. 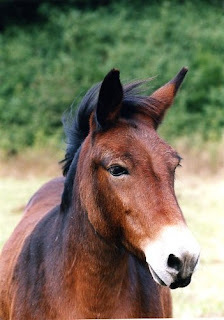 I’m still fascinated by all equines, and no time seems wasted looking at and learning about them. Elizabeth Taylor, star of the film of National Velvet, died on 23rd March. I bet Velvet would have turned up 15 minutes late to her own funeral too (though possibly not for the same reasons). I just can't get into cupcakes; just TOO sweet, but I am happy to drool over Rachael's chocolate brownie recipe. Something to read that is not a pony book: Juxtabook reviews The Weed That Strings the Hangman's Bag by Alan Bradley. Thanks to Rosemary Hall for telling me about Bartabas, who has only just swum across my ken, despite the fact If Wishes Were Ponies has been to see it. And another thank you to Rosemary Hall for this: get the Barney the Boat Dog experience: try horseboating for an hour or two. Yesterday my hens had a new experience. A friend has a lot of hens, and two of her cockerels had attacked each other and had to be separated. I will take one, I said. Although it might be a short visit, because my Black Rocks are terrible thugs. Maybe today's Pony Club members will have to do a five hour ride to camp if petrol prices keep going up, like the members of the Wimbledon Pony Club, who rode down to Bagshot in Surrey for their summer camp in 1953. You can imagine that Noel and Henry and Major Holbrooke are in there somewhere. Horses were bombed in the war too; this picture, of Doreen Mason, land girl, and the horse Spitfire, was taken in August 1941, and is part of the Imperial War Museum image collection. Spitfire was a victim of the Blitz which flattened much of London docklands, and was evacuated to Essex. He was left unmanageable by his experiences, but Doreen succeeded in overcoming his fears. Many thanks to Rosemary Hall for telling me about this image. Many thanks to Fiona for telling me about this clip, which I'd never seen. It's another from the glorious repository of the period horse that is British Pathé. The clip opens with some of Lady Wentworth's Arabians, moves through the 1939 Derby, Ascot and the Grand National, and ends with a marvellous montage of sunlit working and other horses. Susanna Forrest, on If Wishes Were Ponies, posted a piece about sidesaddle on British Pathé. For those who haven't come across British Pathé before, this was a news service who produced cinema newsreels (and, it seems, anything they thought someone might be interested in) for transmission before the main feature film started. The site is an absolute treasure trove, and I found this lovely clip of a Country Show at Ipswich during World War One, when the War Office sent "300 overseas farmer-soldiers" to see the show. Goodness, this makes me feel beyond old. Follyfoot, the tv serial, is 40 this year. The programme was absolutely essential viewing for any pony mad child of the 1970s, with the glamorous Steve and Dora and of course all those horses. This book has been written by Jane Royston, who was Horse Manager on the series for four years. If you are yearning to find out what has become of the actors, there are interviews with many of them. There's also an episode-by-epidode listing and background information from cast and crew. The book's out in May, and will cost £14.99. There's no publisher listed on the info I have. From Tall Stories Books via Twitter. Frankly I prefer Lady Gaga's efforts to these mere pretenders. Thank you to Susanna Forrest, Karen Krizanovich and Twitter for that. Thank you to Usborne for sending me a copy of this book. I 'll get the log jam stuff out of the way first: this is nothing to do with the Linda Newbery book. I don't know if other people experience this, but every now and then I get asked to do something that I find tremendously difficult. The thing in question was to read a self-published book. I very soon ground to a halt with this book, because it was absolutely not my sort of thing. The book then sat there like a toad on the review shelf, glaring at me, whilst all around it other books to be reviewed piled up. I do like to review stuff as it comes in, rather than do the short stuff first (for obvious reasons), or the stuff I like (for further obvious reasons). Although you might not believe it, I try and apply some sort of a system to life. Was it what they expected? Thanks to Rachael from Tales from the Village for this idea. If you have analytics on your site, which I do, you can track what searches people used to find you. I've often cast a cursory look at the keywords people have used, but boy have I been missing a trick. I wonder why anyone would want to know about Chilprufe children's vests, a nightmare I remember vividly from my youth. Those I think must have been the woollen vests Ann Derry's mother forced her to take on a pony trek in Jill's Gymkhana. Ann buried them in a hedge. There was a rather sad search on "nobody loves me enough to buy me a unicorn", which poster must have become all the sadder if they read some of my more trenchant posts on the subject of the unicorn. Hopefully the people who searched for Black Beauty, far and away the most popular route to this blog, were a bit happier with what they found. Goodness knows I've done enough posts on the subject. I’ve recently read a few books by very young writers. Normally this is a genre I avoid like the plague. Colonel C E G Hope, later editor of Pony Magazine, wrote when he was working for Riding: “I find that I have to overcome a certain, no doubt unreasonable, prejudice when dealing with books by children...” I have a lot of sympathy for Colonel Hope’s point of view. Once I made the mistake of reviewing a book written by a child, a review which I thought was basically sympathetic, but oh goodness, the flack I received for daring to say something even slightly negative (which I did, I admit, about the book’s editors). That was the first, and only, blog piece I have ever taken down. I have learned my lesson, and intend not to touch with a bargepole anything written by the young today. Running out of bookshelf space? Amazing autumn light yesterday on my dog walk. I have been quite bad about taking the camera with me over the past months, mainly because dog walking done in the pitch dark doesn't offer a lot of scope for photography. Well, it might if I really got to grips with the interior workings of my camera, but I haven't. I wanted to photograph the lichens and frost blasted leaves before they are covered up by Spring. I want to go back and get a better, less hurried look at the amazing patterns on this tree. I was so struck by it I forgot to look and see if it was elder or hawthorn, and as tree spotting is not amongst my skills, can't alas tell from the photo. Lords and Ladies (or Jack in the Hedge) is already lurking at the foot of the hedges. I was cheered to see the nettle sprouting too further along. It will no doubt get me later in the season. It always does. I'll get the book off to you asap. Earlier this week, when posting out an order to one of the very kind people who ordered from me this week (and thank you VERY MUCH to them too), I explained that the book might take a while as US customs are being a tad picky at the moment. Never mind, she said. The book won't go off, unlike some German sausage she ordered from Wisconscin which was delayed by snowstorms and was a very questionable parcel by the time it arrived. Here's a truism for you: attempting to browbeat your customers by making them feel guilty for shopping elsewhere is a surefire way to make sure they carry on shopping elsewhere. No one likes to shop somewhere you feel obligated: that's not the sort of relationship we have with shops. I like to shop in places which make me feel good, not one where I buy something; anything, out of duty and then scurry out, feeling the accusatory eye of the owner upon me. I reviewed this a couple of years back. I've re read it since, and it more than stood up to it. Please add your name to the comments below and I will do a draw on World Book Night.